The big news about the upcoming JSP set is the long anticipated release of the 1935 Decca test records that Judy made when she was only 12 years old. How were you able to secure the release of these rare recordings? After the failure to auction the Decca test records in 2006, it occurred to me that I might give a talk about them at the upcoming annual conference in WashingtonD.C. of the Association for Recorded Sound Collections, of which I am a member. I started emailing the owner of the records, Cynthia M., in 2008 about the idea, and she was receptive. 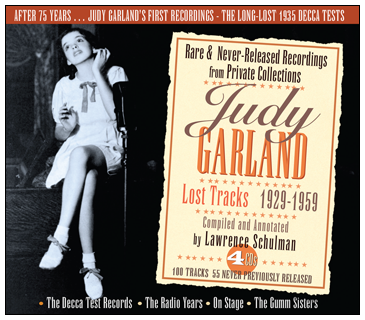 In the course of a year of emailing, I was able to learn much about the records, how she acquired them, and much of the information she so kindly offered me was used in the Judy Garland – Lost Tracks liner notes on the Decca tests, co-authored by Scott Brogan. Despite the wealth of information I had accumulated concerning the records both from her and at The Judy Room, I insisted to Cynthia that if I were to go ahead and propose a talk at an international conference, I would need to play a snippet of the records themselves. Cynthia hesitated, and many months passed. At the end of 2008, I was in Paris for a few months, and the December 31, 2008 deadline for conference proposals was fast approaching. I was still in Paris in February 2009 when Cynthia emailed me that her son would be willing to make the trip to Washington with a digital transfer of the recordings, but by then the ARSC deadline had passed, and the talk never took place. Cynthia and I stayed in touch, and we developed quite a good relation. The story of how she acquired the records, which can be found in more detail in the JSP liner notes, is so incredible it had to be true. I learned as much from her about her connection to these historic records as she did from me about the history of them. When John Stedman, the head of JSP Records, on September 20, 2009 accepted my idea to do a box set devoted to rare and never-previously-released live Judy Garland performances from private collections, it occurred to me that I might try to convince Cynthia to be part of the adventure. In the end, she did. I was amazed. I would never have dared dream I would one day be part of the release of these historic sides. But, here it was. After months of negotiations I conducted with her on behalf of JSP, she and the label signed a contract to license the recordings, and that was it. It was only when I saw there was an online tracking number for the package – that is, that Cynthia had handed over the digital transfer of the recordings at her post office (January 12, 2010) – was I actually sure the whole thing was going to take place. It was on its way. She and I both were following the package online as it crossed the country, and the day it was set to arrive (January 16, 2010) – a cold, snowy one – I was sitting at my desk waiting for the mail woman to pass. When she did, I went out in the icy snow to get the package, took it from her hands, walked carefully back to the house, hoping I wouldn’t fall. I didn’t. I immediately phoned Cynthia, who was overjoyed that her “treasures” had arrived safely. The rest of the set includes radio and live performances never before released on CD, some never before released at all. How did you decide what was, and was not, included? The task was to find artistically interesting performances whose audio quality would not disengage the general public. I gave priority to tracks that had never been previously issued, but when the sound quality of those tracks represented a challenge for the average listener, the bottom line was: if it sounds awful, it’s out. I listened to some borderline cases several times before making any final decision, but my goal was to please the general public, but also keeping the considerations of the fan base in mind. There are a few tracks that show their age, but I felt that their historic interest outweighed their technical flaws. Your last Garland project was the 2008 release “Classiques et inédits 1929 – 1956,” which included a mix of radio, studio, live, and soundtrack recordings. How did working on that set effect your work on this new set, and the choices made? In a way, Lost Tracks is a result of Classiques et inédits. As you know, the French release contained one disc of studio sides and one of radio. Frémeaux & Associés wanted a set that would appeal to the most general public, and therefore felt that including studio sides would have a broader appeal. The radio disc, in their opinion, had more of an interest for the fans. When John Stedman accepted the idea for Lost Tracks, he knew that none of the tracks would be classic tracks so often issued and reissued. The idea of the JSP set was just the opposite. John knew this would be an ambitious undertaking, and gave me the green light the same day I proposed the project. That took courage, and I thank him for his confidence. But, the criteria for choosing one or another track for the French and British project were the same: every track had to have artistic merit and be of good enough sound quality for the general public not to skip the song and go to the next track. I’m sure many fans are interested in how CDs get produced and what the reasons are for what’s included and what isn’t. What was the impetus behind this new CD set and its contents? And, about how long did it take to get produced? I sent an email to John Stedman on September 20, 2009 proposing the set, and he responded the same day with a yes. As you know, it will be released in the United Kingdom on August 2, 2010 and in the United States on August 10, 2010. So, that makes about eleven months in all. I don’t think there is any one way things get produced. I have always believed in making as many contacts as possible if you have an idea for a project. As long as you expect a no for an answer, you will be happy. When you get a yes, you are very happy. Of course, the idea of releasing the Decca tests has been in the back of my head since I heard about the auction in 2006, but I never in a blue moon expected to be part of the story in releasing them. This has been a gift, the greatest experience in my life as a collector. Concerning radio, I guess the bottom line is that once you get to the point where you have amassed all the known commercial releases, you start looking for the unknown. Judy’s radio dates were a great grey unknown waiting to be explored. Even today, I am convinced there is far more to be discovered. The concert tracks are another story. There is not much acceptable audio of Judy in concert in the 1940s or 1950s, so getting any never-released dates released is an honor. Can you tell us what you have learned about public domain and copyright issues? I am not a lawyer. Still, my short internship at http://www.dallastexaspersonalinjurylawyers.com/ has help and having worked with public domain and intellectual property legislation on all four of the CDs I have now done, I have learned a lot. First, one has to realize that European legislation is very different from American. This is as much a philosophical debate as it is about business. In the States, intellectual property is protected from fifty to a hundred years. U.S. law is a bog of many laws, all of which favor business interests. That is, private interests take priority over public interests. Where money is to be made, U.S. record companies don’t give a hoot about the availability of historic recordings. In Europe, public interest prevails. After fifty years, all recordings are in the public domain. The Decca tests, from a legal point of view, required answers to two questions, however. First, when they were put up for auction in 2006, the Garland family, claiming ownership, made an 11th hour attempt to block it. They failed. However true it is that the Decca tests were indeed family property as long as they were in the Garland home, once they discarded them in 1960, and Dorothy Kapano found them on the street, the ownership issue goes from “Who owns the records?” to “Who owns the garbage?” This is in fact a judicial issue I am unqualified to discuss, but this rather funny question was a real source of inquiry on my part for many months. For example, what if you own a pair of diamond earrings, accidentally put them in the trash, put the trash on the street, and a perfect stranger comes by, finds them, and takes them. Are they yours? Are they the perfect stranger’s? Or, what if a syringe with heroine is found in your garbage can on the street? Does that prove you are an addict in a court of law? It’s quite a fascinating question. In any case, in 2006 the lawyers at Bonhams & Butterfields had enough time before and after the two extant Decca tests were put up for sale in order to analyze the issue, and what happened in the end is that the records were returned to the current owner after the failed auction. So much for ownership. A second issue concerning the Deccas was brought to my attention in December 2009 over dinner in New York with a good friend, who is also a lawyer. It involved the fifty years period after which recordings were in the public domain in Europe. He agreed that recordings issued over fifty years ago were no doubt no longer protected by copyright according to European legislation, but what about recordings that had never been released in the first place, which was the case of the Decca tests? If the records had never been released, the period of copyright protection could be said to have never begun. The research I did following this new hurdle produced the following results: On August 1, 1989, new copyright legislation came into force in the United Kingdom. The Copyright, DesignsandPatentsAct1988 (CDPA) [see http://www.opsi.gov.uk/acts/acts1988/Ukpga_19880048_en_1.htm] superseded the 1956 Act. The purpose of the Act (and its subsequent amendments) was to harmonize copyright law in the U.K. with that of its European Union (E.U.) partners, as well as to comply with certain international treaty obligations. Under the current legislation, the duration of the sound recording copyright term remains unchanged (50 years), but is now to endure from the end of the year in which a recording is made, or if published within the original term, the end of the year in which it is published (whichever is the later). If, during the original term, the recording is not published but is nevertheless made available to the public by being played in public or communicated to the public, the term of copyright expires 50 years from the end of the calendar year in which it is first made available. Most importantly, insofar as the Decca test records, the CDPA confirms that the term of copyright in any recording made before June 1, 1957, whether published or not, is to endure from the end of the year in which the recording was made. The “whether published or not,” which I have put in bold, is the key to the issue, henceforth resolved. In July 2008, the E.U. Commission voted to extend the copyright term in respect of sound recordings. It is understood that the 50 year term will be extended by 45 years, so that recordings will then be protected for 95 years. However, the new legislation will not be retroactive and will apply only to those recordings still in copyright on the date of commencement of any national legislation. The term extension will also affect the rights of performers. In that the Judy Garland Decca test records were done seventy-five years ago, there were no further obstacles to releasing them in Europe. Anyone making legal claims was talking hooey, and in any case statute of limitations ruled out any criminal pursuit of the current owner of the discs. Anecdotally, in the course of all the months I worked with John Stedman, we only had one email exchange over a minor copyright issue. Were there any recordings that you wanted to include, but could not for one reason or another? There were several recordings that were a tough call. I am very attached to Judy’s 1936 “After You’ve Gone,” but came to the conclusion that the version I had of it was simply not up to par. The same can be said of the 1948 “Over the Rainbow,” which is the only known recording on which Judy performs the verse, but that too was very degraded. The sound on a 1937 “(Dear Mr. Gable) You Made Me Love You” was just too tinny to make it either. On the other hand, there are some easy calls. There is a terrific swing version of “Ding-Dong! The Witch is Dead” from around 1940, but this was noisier than Times Square at noon. I even sent a few recordings to audio engineer Gary Galo for his opinion as to whether they were recuperable, and I respected his advice. Finally, at some point you have to ask yourself how much the label is willing to invest in time and money to restore a track, and there are some miracles even the best audio engineer has no ruby slippers for. When the set and track listing was announced, the owner of a members-only Garland discussion group began claiming that most of the tracks came from a “library” of MP3s that were posted on that group. Can you give us the story of some of these recordings and where they come from? Daniel Berghaus, who heads The Judy Garland Experience, which is housed at Yahoo, seems to think the world turns around him. I would say I was collecting Judy Garland recordings before Mr. Berghaus was born, and have far more experience in collectors’ circles than he might imagine. I have read his mad rantings to the effect that I do not give my sources for individual tracks, and despite his insistence that I name names, I won’t. Collecting is an art based on confidence. It is one that not only involves knowledge of the music, but knowledge of how to deal with people. I think that dealing with people, trying to learn from them, trying to understand their interests, and then, and above all, taking the precious information they have given you, adding to it, and sharing that added information in turn with them creates a trust, and very often a friendship. My most vivid memory in the preparation of Judy Garland – Lost Tracks involves the song “Ma (He’s Making Eyes at Me).” The owner of this particular track did not know what it was. She had made a transfer of her original Presto disc on to CD, and in early 2010 asked me to listen to it over the phone. I told her that Judy had performed the song on radio in a duet with Bing Crosby in 1949, so if she were performing it solo on the disc she had it could not be the same performance. But what was it? So, in the middle of the winter here in Maine, she played the CD transfer for me by placing her phone near her loudspeaker. Since I am pretty good at this point at pinpointing Judy’s voice by year, I immediately was able to tell that the recording dated from 1939 or 1940, and was probably from The Pepsodent Show with Bob Hope. Since information is sparse concerning the Hope shows, I was not able to find out exactly which show the performance came from, despite further research. So, the track is marked with the information available as of today. I hope further research concerning the Hope shows will allow us to know more. In any case, listening to a never-before-heard recording over the phone, and at the same time helping the owner identify exactly what she had, was a rare treat and is a great memory. I thank her for allowing me this pleasure. The liner notes for the set have already been accused of being sparse. What is the decision process behind whether a CD set has an extensive booklet included or not? Whenever I have done liner notes, I have always looked at the most recent releases at the respective label to get an exact idea of the style and length of their liner notes. In some cases, the sky’s the limit. This was true for the Classiques et inédits set I did for Frémeaux & Associés two years ago. In the case of Judy Garland – Lost Tracks, it was the policy of JSP Records to invest in restoring and remastering the sound on their releases, rather than invest in an extensive brochure. I found it, in fact, a stimulating challenge to be brief. Generally speaking, I think it is a good idea for record labels to invest in making sure the sound quality is state-of-the-art, rather than flattering the ego of whomever is doing the writing. Many recordings, especially rare radio tracks, have been traded around for years. The tracks on this set sound so much better than what’s been previously available. How is the restoration process accomplished with such old recordings? I am not an audio engineer. JSP Records has for decades been renowned for its restorations, and the Garland set is no exception. The Decca tests stayed in my house for exactly one day, after which I sent them to Gary Galo, who is an audio engineer at the Crane School of Music, SUNY at Potsdam, NY. I also sent him the newly discovered “Ma” acetate, as well as the disc of the 1941 “Strike Up the Band,” which had a pretty serious buzz on it. He took a few weeks to work on them. I then sent them, and all of the recordings, on to JSP in London, where everything was remastered by Peter Rynston, of Tall Order Mastering. When I got the test pressing back this spring for approval, I was given the choice of using the Galo restorations, or the Rynston ones, on the Deccas and “Ma.” I chose Peter’s work because he had removed some surface noise without taking away from the dynamic of the recordings. I felt the noise reduction had been applied in moderation, and insofar as the general public, the less noise the better. In professional and academic circles, no-noise is often a no-no in that it can also remove some musical range if used abusively. I felt the compromise offered by the Rynston remaster was acceptable. So, in fact, there is a Cynthia M. transfer, a Galo restoration on four tracks, and a Rynston remastering on all tracks, including the Galo restorations. Such is the care that was paid to the sound. Insofar as all of the other radio performances, what took me the most time was in choosing the best sound quality among the recordings in my collection. If I was still unhappy with the quality of what I had, I sought other copies from other collectors. Last, there are many radio tracks in the set that are new transcriptions, and these sound extraordinary to my ear. Concerning the stage tracks, Peter Rynston has worked miracles to remove clicks and surface noise. In all, despite some rough patches on some of the radio tracks, I am very happy with the overall result. Aside from this new project, what is your favorite Garland recording, and why? I have always answered that question the same way. I find her film performance of “Have Yourself a Merry Little Christmas” the greatest Garland recording I know. Her longing hopefulness tinged with shades of becoming an adult has always touched me deeply. Judy’s radio work has been sadly underrepresented on CD. It seems like most of what gets released are newly packaged versions of things we’ve heard before. Do you think this is the case, and if so, why? Judy’s radio work is an essential part of her career. Over the years, LP and then CD releases, very often from Europe, have provided more radio broadcasts of Judy’s performances than one might imagine. They are just scattered here and there. But still, all together they take up quite a bit of space on a shelf. I can still remember first listening to the 1935 “Zing!” on a Danish CD buried in the middle of a lot of Decca studio tracks. What a thrill! The radio broadcasts are by nature not always of the same technical quality as studio tracks, so maybe that is one reason why companies have shied away. I think too there is an element of ignorance: people link Judy to her film career, on stage, and at the various labels she did studio sessions for, but her radio work is not as well known. We do get repackaging of a lot of the same stuff too, but many times better transcriptions have turned up that merit re-release, which is most fortunate. Otherwise, I guess one can say that a lot of companies are environmentally friendly: they work hard at recycling. Garland fans are known to be notoriously “touchy” for lack of a better term. There is a lot of drama and infighting over projects and ownership. The Internet has only amplified this. What do you think of the online fan “community,” and is it a positive, negative, or middle of the road influence? Thank you for your letter. Sonny Gallagher mentioned you several times, always favorably, and I am glad to see that we are in total agreement about the Garland cult. Sonny warned me – often – about what I might expect from some of the fans, and I realized almost from the beginning of my research, long before the internet was available, that they would not like my book, or any book not written by one of the cult hacks. I was very late connecting to the internet, but I was able to log on a couple of months before my book came out – and they were already denouncing it! Without even having read it! Someone had heard something from someone who had heard something, and that was enough evidence to tar and feather me. At that point I realized that these were not serious people, or people to be taken seriously. Still, I was surprised by the venom, the nastiness and – may I say? – the childishness they displayed. I have never been able to understand why these people, almost none of whom ever knew her, think they have been ordained by heaven to be Judy’s protectors and guardians. But then I have never been able to understand cults, and that is what we’re talking about – the Church of Garland, as you so aptly call it. Deviate an inch from the accepted dogma, and you’ve committed something equivalent to the Albigensian Heresy. Isn’t it ironic, though, that Judy, who lived to entertain and give pleasure, is now worshipped by people so full of anger and hate? But the good news – and there is good news – is that these self-appointed guardians of the faith are in a tiny minority. During the past couple of months, I have been on a long publicity tour, with readings, as well as interviews, in thirteen cities around the U.S.. In most places I got pretty good turnouts, and, with the exception of Atlanta, where I spoke at a gay bookstore, my audiences were altogether mixed – young, old, straight, gay, men and women. The questions, moreover, were intelligent, and the occasional quibble with my book was raised without rancor. What a welcome contrast to those pathetic people on the internet! You are not the only one, by the way, to tell me he’s been excommunicated from the Judylist. Consider yourself in good company. I did get “Judy Garland at the Olympia,” and I admired your very perceptive liner notes. I look forward to getting the other CDs, as well, of course, as your book. My own book will be published in England this fall. There are no plans for France, however, My French agent says the French have no interest in Judy Garland. Is that true? A lot of non-Garland aficionados out there might ask, “Why Judy?” “Why now?” “Why should anyone care about old performances?” So I ask, what is it about Judy Garland that attracts you to her and her performances? Her sincerity. I would never call Judy Garland “old.” She is eternal. What she did when performing at her peak is as relevant today as it was decades ago. She was perhaps the greatest singer of her generation, and she was performing in the years that classic American pop was its richest. In that sense, her Carnegie Hall show was a summing up of a whole era by the best of that era. But above all, Judy Garland does not entertain me. In fact, she often scares me by her intensity. She was not a wind-up doll meant to amuse. Calling her “the world’s greatest entertainer” is to belittle her. She was arguably the greatest interpreter of American popular music of the 20th century, and labeling her a mere entertainer is to totally miss the point. Judy’s poignancy and power are gripping, and one lessens her importance by treating her like an evening out. Other singers, with technically better voices than Judy Garland, have come and gone. But Judy and her legacy endure. What to you think is the reason that she’s still a revered and celebrated performer over 40 years after her death? Judy Garland was unique. She was technically less skilled than some of the big band singers of her era, such as Peggy Lee and Frank Sinatra, but she had an emotional impact no one else could match. I recently listened to Mildred Bailey’s “It’s Love I’m After,” which she recorded in 1936 on Vocalion. Judy, of course, first sang the song in the 1936 20th Century Fox film, Pigskin Parade. The Bailey recording could be said to be the very first cover of a song Judy first performed. The difference in interpretations is fascinating. Judy’s performance is exuberant. Bailey’s approach is much more in the line of the swing era. However polished Bailey was (and she is truly one of the great singers of her period), Judy had a connection to the public that was obviously amplified by the visual impact of not just singing it but singing it before a camera. This connection, heart to heart, is what touches our hearts today, and always will. By the way, who thought up the name Lost Tracks? Now that this new release is almost in stores, can you tell us what your next project is and when we might anticipate its release? I plan to go to Paris and expand my horizons. Wonderful, insightful, thoughtful, and thought provoking. I for one can't wait to get my hands on this new important box set. Really enjoyed reading this post; excellent to learn of someone who is able to add some objective (and knowledgeable) information to this new Garland set. I don't necessarily agree with all the things he said about The Judy Experience, but I am glad and grateful for what he has done for the production of the release and for keeping Judy's name and reputation in a positive light. I am looking forward to purchasing it when it is released. I don't think of Judy as a religion and I don't think many of my colleagues at the Experience do either. Great interview regarding this fantastic release!But, however, I disagree thoroughly about the Judy groups such as the message board. We certainly do not treat Judy as a religion. We are just very passionate about Judy, her career and her personality. And we ''jump to her rescue'', so we can focus on her positives and not on her negatives, like so many people seem to do nowadays. Judy loved her fans, how they respected her, appreciated her, and enjoyed her talent. We want to wish Judy thanks for her gifts to us! That was quite a bit of pompous and foul smelling hot air.Mr. Schulman says he is a pariah in the Judy Garland community, and with a bitter and ugly tongue like his, it is no wonder why.Not only does he attack indviduals who are beloved in Garland circles but he derides the rest of the community as well. Mr. Schulman also says that people miss the point by calling Judy a mere entertainer. it appears that Mr. Schulman is the one who misses the point. Nobody ever called Judy Garland a mere entertainer, she was always THe World's Greatest Entertainer, a distiction that Mr. Schulman apparently doesn't understand. The Decca test tracks are really great but although the selection was excellent I was very disappointed at the “restoration” of the radio tracks, many of which have been available as MP3 downloads for some time. There is obvious and very annoying noise reduction applied to many, taking away huge amounts of detail in her voice along with the scratches. For instance, listen to her fabulous version of Cryin’ for the Carolines, a downloadable MP3 from The Judy Room. A nicely trebled recording with some evident surface noise but projecting Garland’s voice powerfully and clearly. Then compare it to the same broadcast on this CD set. A low pitched electrical hum in the background, very muffled sound and and Judy’s voice heard as if through a mattress. So is “restoration” is getting rid of surface noise no matter how much it distorts the voice of the century? I did not use MP3s, so using the “Cryin’ for the Carolines” at The Judy Room was not an option. Otherwise, most other reviewers of the set have found the audio restorations by Peter Rynston of both the Decca tests and the radio appearances to be resplendent, despite the age and frailty of many of the recordings.